Have shown the Singer 911 before, but never posted pics of their white one. This is probably my favorite to date, because of its interior. The subtle olive green is absolutely awesome. The only thing I’d do differently is the steering wheel. I know it’s a classic and all, I just prefer a 3 spoke to a 4. Other than that, this is automotive Nirvana. On most of the ‘tuned’ Japanese cars out there, people take a more is more approach. Piling parts upon parts without much thought as to the final outcome, or whether the lines of one flow with the lines of another. Or tossing a bunch of off the shelf parts together into a stew. A bit like a paint by numbers collage. One part Brand X, one part Brand Y and you end up with a car that looks like many others you’ve seen before. The coolest ones out there, to me at least, are the ones where things were taken to the next level. Where a level of customization was done that separates it. Covering a part in leather or genuine alcantara to give it a more finished look (like the rollbar in this car). Yes, using quality parts is important, no question about it. But having a next-level car is about putting your own signature touches and making everything cohesive. A pretty easy DIY install if you have the right tools. This can also be used as a DIY for the SPL solid compression rod bushings too, though they need to be pressed in as well. What you will need: wratchet and socket set, press, die set, heat gun, pry bar, rubber mallet, factory service manual. Time required: unrushed, you can do it in about 2.5 or so hours. Process: This is in abridged form, consult the factory service manual for torque specs as I don’t have them handy. Note the front splash gaurd can be left in place, or can be removed totally, your choice. The swaybar can also be left in place, as can the lower control arm. 2. jack the car up or put on lift. If using a floor jack, suggest putting jack stands under the side points, under the front door. 4. Remove cotter pin for the ball joint from the compression rod to front hub/knuckle. Use a 19mm socket to remove the nut and free the ball joint. 5. Remove the front crossmember – there are a series of 14mm bolts and 1 19mm bolt. 7. Now, the fun stuff! The stock busings are a very soft rubber, and encased in a thin aluminum shell. You will need to go to your press cup set and find the right one to fit the inner section, so that you’re pressing on the aluminum case, not on the arm, and not on the bushing – 1-11/16 is perfect for the job. This will ensure all the torque the press yeilds, is going towards pressing the bushing free. I’ve seen some use sockets for this, and I can’t stress enough how much I don’t recommend this. Sockets were not meant to have this sort of force on their thin walls. Could it work? Sure. Is it smart? Nope. Get a good press cup set. They are inexpensive and designed for this exact type of job. 7A. Depending how old the car is, where you live, and other factors, you may need to provide some liquid, or heat encouragement to the bushings. A small butane or propane torch comes in really hand here, and/or a can of your favorite penetrating oil (Nuts Off works great for these jobs, though it was not used for this install). 8. Next up, install the Whiteline Bushings. These do not require a press. You’ll notice once side of the recepticle is chamfered, the other side is not. The mallet comes in handy for the side that is not chamfered. Using the supplied grease, generously apply to the inside of the empty “socket” as well as to the side walls of the Whiteline bushings. These install as ‘halves’, sort of like a sandwich. The supplied metal tube is then put in place down the center, and this is what the bolt will ride in. Again, use the grease on the walls of the metal tube too, and tap in place with the mallet. 9. Now, re-install the arms back to the car. For the cotter pin, probably best to replace it, as they are thin and don’t like being bent and re-formed back in place. Safety wire can be used as an alternate as well. When reinstalling the compression rod, to get the ball joint to sit, its easiest to have a friend slowly turn the wheel from full lock, back towards center, and use the rubber mallet to tap the arm. This way, the ball joint rests squarely, and you’re able to fully engage all the threads. 10. The rest is self exaplanatory – reinstall the front crossmember to factory torque specs, reinstall the wheels, and lower the car. Don’t forget to torque the lugs in a star pattern once the car is on the ground! What you’ll feel when you’re done? Holy cow, steering response!!! Particularly if you’ve done, or are doing, the lower control arm bushings at the same time. If your car had any wandering to it, even after an alignment, it will track straight as an arrow now. Where the factory bushings are not fully encased in rubber (which gives them their softness but also what causes them to fail), the Whiteline units are full urethane, much more surface area, and much less deflection. Contact z1sales@z1auto.com to get in on the deal! As wonderful and robust as a 350Z is, like any other car, it’s got it’s share of quirks. The very early cars has transmission issues (solved by Nissan with later revisions), some of the interior stuff is easily scratched. Revup engines are widely known for oil consumption issues. So it goes – every car has it’s faults. One area that is of particular concern for Z33 drivers are the front bushings. The stock bushings are a soft compound rubber, designed for comfort vs longevity. Even on bone stock cars, they are known to start going bad in the 30k mile mark. Add in lowering via springs or coilovers, stiffer spring rates, and wider, heavier tires with lower offset wheels, and the weak factory parts become even more taxed. The compression rod bushing is an area of particular concern for the 350Z and G35. This horshoe-shaped, aluminum rod makes up part of the front suspension, sitting between the front crossmember and the hub. It features a bushing on one end, and a ball joint on the other. The balljoint is quite strong, and hasn’t proved problematic. The compression rod bushing is another story altogether. Nearly every G35 customer we’ve got has replaced these at least once. 350Z guys also have this part fail over and over. For some reason, Nissan sells a replacement compression rod bushing on the Infiniti side (via part # 54570-AC70A), but not on the Nissan side. Some claim this bushing is “revised” from Nissan. We’ve never found any tangiable evidence that that’s true though. In the aftermarket, for the longest time, the only offering was SPL’s solid compression rod bushing kit. A terrific piece indeed, but really more suited for track use vs street use, as it can be sort of noisy because of the location. Not to mention, so many people have already replaced their lower control arm bushings (inner and outer) with the Whiteline Urethane pieces, that fitting a solid bushing isn’t exactly a perfect match from a stiffness standpoint. NISMO does a version of these as well, but each time we check, they are not available – sort of perpetually backordered. There is another brand, called Armstrong, which is unique in that it’s a solid urethane design. Have not had a chance to try those as of yet. The Whiteline is more of a sandwich approach so installation is simple, though removing the factory ones does require a press. Last year, Whiteline introduced a urethane Compression Rod Bushing Kit. We’ve sold quite a few, but never had a chance to do a direct comparison vs. stock. We think the picture speak for themselves. The Whiteline bushing is so much more solid vs the sloppy factory unit. It’s also a considerably higher durometer, but not so overly stiff that it isn’t very comfortable on the street. While not a huge fan of the Stillen S/C, it’s a unique build for sure. Will be interesting to see what it is able to put down once the bottom end is fortified, fuel upgrades installed, and it’s tuned. A thank you goes out to all our readers, as we have passed the 2M mark for views, since the blog began in 2008. 2013 marks the 25th anniversary of Endless and their absolutely fantastic products. Here’s to 25 more, and 25 more, and 25 more…..
RE Amemiya has steadily been upgrading one of their FD3S RX7’s during 2012. New Aero and a recent heart transplant using an HKS T04 turbo, among other touches. Still sticking to the tried and true, albeit dated Apex’i Power FC. If it ain’t broke, don’t fix I guess! One area of the car that is sometimes tough to clean are the various plastic pieces in the engine bay – particularly the washer tank bottle and overflow bottle. They come in that nice, milky white when new, but often become dingy and grimy over time, both inside and out. A simple solution is right in your house! Mix 4 parts hot water, to 2 parts laundry detergent or liquid dish washing detergent, to 1 part bleach in a bucket. Next, get an old toothbrush, or an old washcloth. Submerge the piece to be cleaned, and scrub any heavily soiled areas with the brush or cloth (such as any raised lettering, which often collects dirt and grime between the letters. For the inside of these reservoirs, pour some of the mixture inside and just swirl it around, and watch the stains disappear. Rinse with clean water, and air dry, and you’re done…looking good as new! This also works really well on those pesky license plate lenses too. Anyone can order a part and bolt it in place. I love the details. The little things that only the one driving the car gets to enjoy. The small pieces that flow seamlessly with everything else, and inspire you to emulate the feel in your own project. 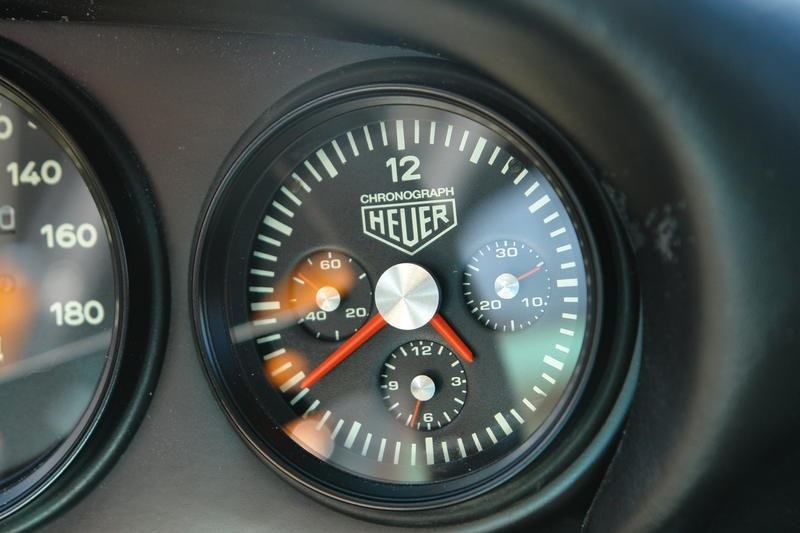 I can’t think of a better example than the Tag Heuer chrono clock in the Singer 911. Analog Heuer chrono’s, and timers were often found in performance rally and race cars. Singer has incorporated a classic looking clock into their “old but new” 911. The result is a simple, elegant nod to days gone by.